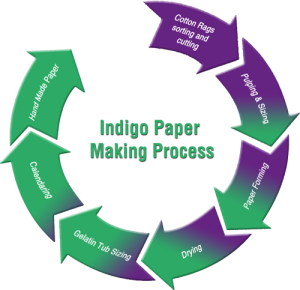 Indigo Paper is predominantly made using handpicked cotton rags from hosiery mills and imported flax fibers. Other raw materials like banana fiber, flower petals, woolen fibers are used to give distinct look to certain category of papers. The indigo artpaper is made using traditional Indian paper making technique to produce durable tough high quality water color paper. All the papers are produced using pure water derived from our own well and special fibers like cotton and imported flax fibers. Cotton rags are carefully chosen by Indigo defined standards. These rags are then cut in to small pieces in a rag chopper. Flax fiber is sorted and cleaned. Then these fibers are then cooked in alkaline medium at controlled conditions to remove any lignin present in the fiber. Finally the fibers are washed in neutral pH water. The final product from the sorting and cleaning section is then pulped mechanically and beaten vigorously in water using a Hollander Beater for five hours to separate individual fibers. This process leads to enlargement and bonding between the fibers. We do not add any chemical or bleaching agent to our process. The Pulp is sized with an additive. The sizing process is need based, as per the requirement of the user the paper can be under sized or over sized. The sheets are formed individually by trained craftsmen. The measured aqueous pulp slurry is poured into a mold. This slurry is sloshed around on the mold to get a uniform coating. As the slurry is drained out carefully from the mold randomly interwoven fibrous sheet is formed on the mould. The sheet is then mould is lifted from the vat and sheet is cast down onto a woolen felt. One sheet at a time is carefully made, giving each sheet a characteristic ruggedness and uneven edge called deckle edges. Multi-layers of felt and sheet are build to form a pile. The pile is then pressed to remove excess water from them. The papers are separated manually from felts and each sheet is hung in a cloth line and loft dried. Loft drying allows the long fibers in each sheet to dry slowly contract and interlock naturally to attain excellent strength. The dried sheets are then individually immersed in hot gelatin bath to absorb gelatin and then allowed to dry slowly over a period of few days. This process continues to improve the strength of the paper as it ages over a few months. Rough surfaced papers retains the impressions of the woolen felts and bypass calendaring process. Whereas, medium and smooth finish papers are cold pressed between zinc sheets.